It can be tricky to get some modern kids to willingly play outside. One option is to lure them out with some cool technology like a programmable robot. Of course not all robots are equal when it comes to venturing outdoors. In this article we'll take a look at the best programmable tech for taking out in the garden or down to the park. Posts like this always result in some people suggesting that kids should be playing with sticks and mud. As it happens my own kids are actually pretty keen on sticks and mud. Sometimes though they need to a nudge to get outside in the first place. Plus, there's time for sticks and mud and technology - it's not a binary decision. If you want to combine tech and mud then Sphero is the best option - it's waterproof and washable. Or use a drone to take an aerial photo of natural artwork. By programmable we mean that kids can use some form of repeatable code to tell a robot or toy what to do rather than just using a remote control or preset commands. Controlling tech toys is fun but we prefer products that can also be programmed as they help kids develop additional useful skills. Most floor robots require a flat surface to operate well and tend to prefer being used indoors. Sphero and Ollie are an exception to this. They're very happy out doors on a hard surface or at a skate park. You'll need to make sure you've got plenty of room and there's no danger of hurting other kids as these robots are fast, especially Ollie! A big outdoor space is definitely the way to get the best from these robots. They really do move quickly and can cover a lot of ground. We've got to know the quieter times at our local park so that my 7 year old can take his Ollie for a spin. Both robots can be programmed using the Sphero SPRK app which runs on iOS and Android as well as the Kindle Fire. The Kindle Fire is our first choice outdoor robot controller tablet as it's fairly inexpensive and portable. Drones and quadcopters are an obvious choice for taking outdoors. They're cool and entertaining. Many drones and quadcopters are not at all suitable for kids to fly - though they'll still enjoy watching them if you take safety precautions. However there are quadcopters that are kid-friendly with supervision and even programmable. The Parrot range includes several models that can be programmed from the Tickle iPad app or the Tynker iPad and Android app. Both apps offer kid-friendly drag and drop coding. In our experience coding actually makes quadcopter flying a more accessible activity for kids as they don't have to be so reliant on their coordination and quick reactions. Instead they can plan cool moves ahead of time and then replay them repeatedly. In our experience quadcopters don't tend to be quite as predictable as floor robots, but they're a lot of fun. Just make sure that you have plenty of space. Tickle supports programming the Parrot range of drones that are designed for a younger audience (with supervision.) This includes the Rolling Spider as well as the awesome Airborne Cargo which can transport a LEGO figure! Tynker also has support for Parrot drones and has some excellent starter activities. Tickle even has support for the Parrot Hydrofoil robot which you can program to move in two dimensions through water. Obviously you'll need access to a suitable body of water for this one. We haven't tried it, but it looks like a lot of fun! Hackaball is a fun programmable ball that kids can use outdoors. 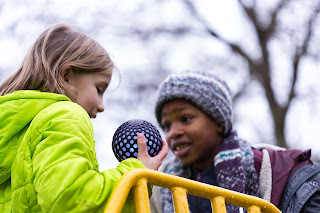 Hackaball is packed with sensors and lights and can be thrown, bounced and played with outside. Hackaball games can be programmed with an app and then kids can have fun playing the games that they wrote and getting exercise at the same time. Very much in line with our thinking here at Tech Age Kids! Hackaball is currently available for Pre-Order, check out our interview with the Hackaball creator. 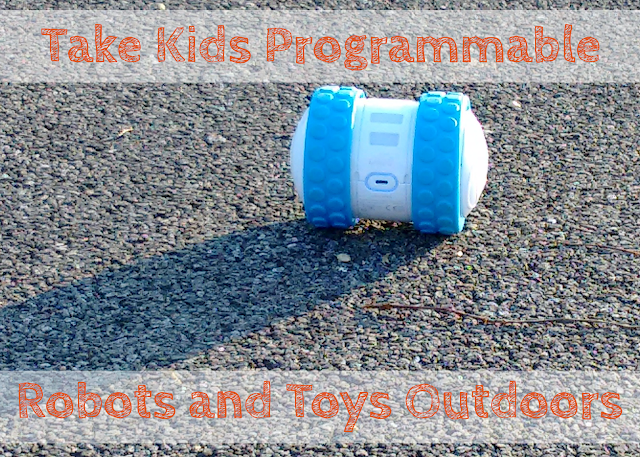 For more detail on some of the robots featured in this article check out our Guide to Programmable Robots for Children.